Sample tweet: "It became quite difficult to state I was 'in the best shape of my life' in Spring Training once the syphilis took hold." Ever wonder what a belligerent 1880s pitcher who once started 40 out of 43 games might think of today's pampered athletes? Luckily, we have Old Hoss Radbourn. One of the more creative phony Twitter accounts out there imagines Radbourn  a real-life Hall of Famer who won 59 games for the Providence Grays in 1884  as a vain, hard-drinking curmudgeon who makes crude remarks in 19th century syntax. (Based on the historical record, this might not be far from the truth.) Upon hearing that Seattle Mariners center fielder Ken Griffey Jr. took a snooze during a game, Old Hoss wrote, "A 'mate of mine once fell asleep in the club house during a game. This was quite good, as at the time I was rogering his wife in my locker." On Mother's Day, Old Hoss tweeted, "A dying woman once asked me to 'hit a home run for her.' I told her she was crazy. It was really hard to hit home runs! Sorry, mom. RIP." And during this year's spring training, he noted, "Like this D. Jeter, I once tried to eliminate a stride in my swing. Skipper shot me in the leg. Other than gangrene I was right as rain." The tweets make you wish that the real Radbourn, who died during the second Cleveland Administration, were still around. 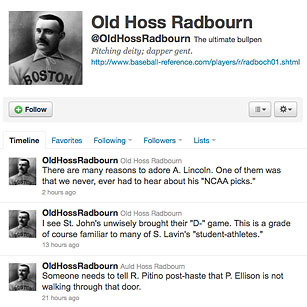 See "Old Hoss Radbourn and the Rise of Fake Sports Tweeters."